Schedules are packed this time of year with summer wrapping up and the school year right around the corner, so we rounded up some of our favorite quick-and-easy dinners to give you and your family the energy (and time) to enjoy all the season has to offer. Quesadillas are a great option for a busy night. This calls for our Spicy Ranch Pulled Chicken, which is a great chicken recipe in its own right. You can prepare the meat before hand and keep it in the fridge, or throw it in the slow cooker in the morning then assemble the quesadillas in minutes come dinnertime. If you find yourself frequently reaching for the pizza delivery number, you need to give this recipe a try. Using naan instead of traditional pizza crust is a great way to mix it up, and since it doesn’t require any rolling or prepping you’ll have dinner together in no time. This recipe comes together in less than 30 minutes start to finish, is packed with flavor and offers a light-tasting twist to the traditional lamb gyro. With only 5 ingredients, this is an easy meal to keep on deck for busy nights. 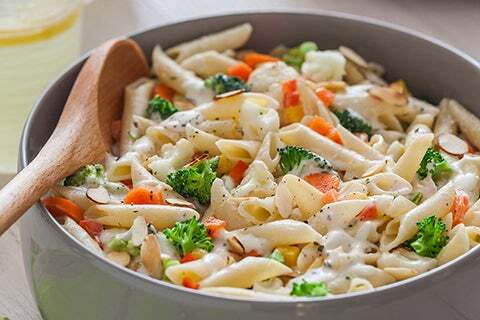 Frozen vegetables give you the nutrition you need without worrying about a short shelf life, and the cream cheese ranch sauce might be even easier to make than trying to muscle the lid off the store-bought version. 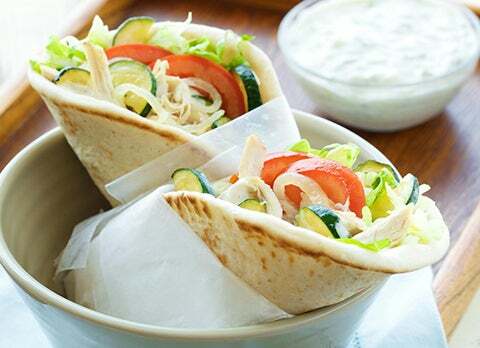 Cheap, easy and tasty: What more could you ask for? This recipe is great as it stands, but is also easy to modify to you and your family’s preferences.